Get your FREE Auto Transport Quotes and start saving right away. When Companies compete for your business – You Win! It’s simple: Just complete a quote in about 30 seconds. By answering a few questions, you’ll see rates for other top Auto Shipping companies. That means in roughly three minutes, you can compare rates from other top companies simply and easily. Compare rates to get the combination of price and service that’s best for you. Why compare auto shipping rates? Looking for a Auto Transport Rates? Lucky for you, we have you covered. If you're new to Vehicle Delivery, want to switch to a different company or looking for a low rate, choose Crowley. By shopping for lower rates, you could save hundreds on your move. Overwhelmed by all the choices? Don't be. Crowley makes shopping for companies easy. We'll help you find the services you need at a rate you can afford. With a Crowley quote, you can get rate comparisons, money-saving tips, discounts, payment plan options and more to make your rate even lower. Get the rate you're looking for. Since 1985, Crowley has provided car shipping at competitive rates to customers across the country. With Crowley, you can move your vehicle, motorcycle, boat, RV, and more. We're one of the largest auto carriers in the country - a spot we've earned by providing great nationwide delivery, competitive rates and superior service. Choose Crowley for a low rate and see how our rates and great service can help you. Auto Shipping and so much more. Now that's Crowley. Get 7 Rates, Compare & Ship right here. Why compare auto transport rates? Compare rates before you buy — you could save money. When you're shopping for Auto Shipping, you'll most likely compare rates from different companies before you buy. Though you may spend a bit more time researching when you compare rates, many people do this to get the combination of price and service that is right for them. We're right there with you. In fact, to help you achieve this, we give you the opportunity to compare rates in one place — in just a few minutes, no less. 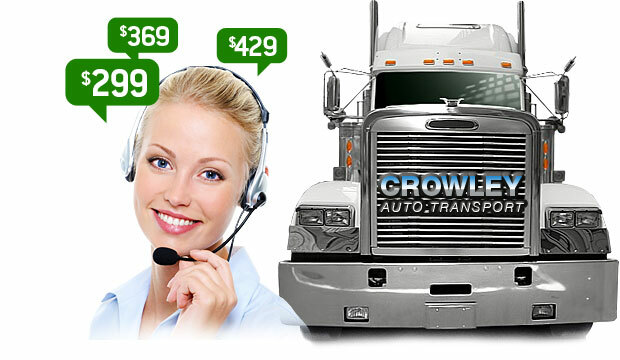 It's simple: Just complete a Crowley Transport quote in about 30 seconds. By answering a few questions, you'll see rates for top companies immediately afterward. As you compare rates, you may discover One company offers low rates. Or, you may find another company offers even lower rates. That's the advantage of choosing to compare rates: You'll have rates for several companies in front of you to help make your decision easier. Remember that what a company offers is reflected in the price. Ultimately, you should compare rates to get the combination of price and service that's best for you. If you're in the market for auto shipping, choosing Crowley can help make your shopping easier and more informed. Get a Crowley quote, then compare rates for other top companies in about 30 seconds - all in one place. Get started and compare Auto Shipping rates now! Our founder invented enclosed transport for vintage vehicles and antiques in 1970. Since then, Crowley has moved (or found a way to move) just about anything on wheels. When it comes to classic vehicle hauling, experience counts at Crowley. We know the ins and outs of the collector car auction scene. We've been working them on-site for more than 30 years and know what it takes to get your collector and vintage vehicles from the auction floor to your door. That's why Crowley is the official carrier for RM Auctions, Inc., presenters of the famous Monterey Sports and Classic Car Auction. We are also on-site at most major U.S. auctions. Whether you need to ship vintage vehicles to sell at an auction, or plan to purchase some at an event, we've got you covered. Need to ship a vehicle between the U.S. and Overseas? Rest assured and leave it to Crowley Transport. We do it all – motorcycles, cars, vans, sport utility vehicles (SUVs), trucks, RVs and other motorized vehicles. New, used or one of a kind, each gets special attention to get it to its destination without incident. Our professional, knowledgeable staff will provide the help you need to ensure a safe and worry-free experience. Crowley's Quality and Safety Management System ensures that we meet or exceed customer expectations regardless of whether you want to ship one vehicle, or thousands of new and used vehicles. For more information on relocating your new or used vehicle please contact our Customer Service Department by using our quote form. How do I determine the cubic feet (cft) of my vehicle? The cubic feet of your vehicle is determined by multiplying the length, width and height of your vehicle. How much fuel can be in my vehicle? Due to safety regulations your vehicle’s fuel tank must be less than one-quarter of a tank but should contain enough fuel for delivery, loading and discharge, and reaching a gas station after pick-up at the destination port. Are personal effects or cargo allowed inside the vehicles? Personal items and cargo are not permitted to be shipped inside the vehicle. Do you offer insurance for the vehicles? Insurance can be purchased for $1.12 per each $100.00 of value declared. Think about arriving at your favorite vacation spot ... but instead of waiting in line to get your rental vehicle, you catch a cab to your hotel where your own vintage vehicle, sports car or bike is waiting for you! Martha's Vineyard in your Maserati? South Beach in your Soft Tail? The possibilities are endless to make your vacation memories a lot more memorable. Crowley will deliver your vintage car, hot rod or muscle car wherever you'd like in the United States, so you can enjoy your vehicle wherever your vacation takes you. We will deliver your vehicle to your hotel, a family member's home or wherever you request. And if you authorize it, you can have a third party sign for the vehicle prior to your arrival. Call today to cruise around your vacation getaway in the sweetest vehicle on the road ... yours! Whether you need your vehicle delivered to your new home or to your new office, we will accommodate you. Count on Crowley. We are a leader among exotic vehicle movers and can get your vehicle where it needs to be safely and on time. Convenience: We provide door-to-door service. No inconvenient terminals or hassles means one less worry. Peace of mind: All vehicles are tracked by satellite, so we know the status of your vehicle at all times. The best in vehicle relocation: Enclosed is the safest method of vehicle delivery available. Your vehicle is completely protected from the elements throughout shipment. If your profession requires you to move to a new city, turn to Crowley for your auto moving needs. All it takes is one phone call, we'll take care of the rest. From Palm Beach, Fla. to York Beach, Maine and everywhere in between, you'll see Crowley trucks. We winter in Florida and summer up East just like you. We also provide service for snowbirds who prefer the deserts of Arizona and California. We know the intricacies of serving gated communities, apartment complexes and condos. Snowbirds have been among our most loyal customers for many years ... and continue to use our reliable services year after year. Why do snowbirds count on Crowley? No hassles: We provide reliable auto shipping and door-to-door delivery, so you don't have to deal with getting your vehicle to a terminal or worry about picking it up at one. Snowbird truckload special: If you are part of a club of snowbirds traveling to the same area, we'll provide a discount if your group can fill a truck. Our Experience: We've been moving snowbirds for more than 30 years. If it's on wheels, we've moved it before. Our customers can depend on us for reliable auto shipping services. When it is time to make your seasonal move, snowbirds can count on Crowley. We'll be ready. Since our founding in 1985, we have shipped nothing but treasured vehicles door-to-door with our outstanding vehicle delivery services. Because we share your appreciation for automobiles, we treat each vintage or classic as if it was our own — making Crowley among the most dependable company for your valuable vehicle relocation needs. We even provide temperature-controlled carriers for vehicles needing additional care. Our founder, an icon in the American auto industry, loves and has loved automobiles since he was a young man—as a driver, collector and enthusiast. He treats your vehicle just like it’s his very own. He has built a high-quality vehicle moving service that thrives on excellence, optimal personal service, customer loyalty and attention to every detail. This assures that your car or truck arrives at its destination quickly, safely and in mint condition. That’s why Crowley is #1 nationwide! As a vehicle hobbyist, Crowley realized automobile transportation was risky. Enclosed shipping had not yet arrived, and open transport – the only type available at the time – subjected delicate, collector and classic to rough weather and road grime. The large collector vehicle auctions and private sales that were beginning to take off spelled opportunity for Crowley. In 1970, Crowley purchased Frosty’s Delivery Service, a vehicle delivery service equipped with two flatbed trucks, and renamed it Crowley. With three employees – Crowley, another driver and a secretary – Crowley was on his way to becoming an entrepreneur and enclosed vehicle mover. It wasn’t long before Crowley decided to implement an idea that revolutionized the industry. He rented tractors and purchased furniture trailers from a local retailer, altering the 40-foot trailers to enable them to haul two vehicles. With the new equipment, Crowley became the only U.S. company equipped and insured for classic vehicle shipment. By the mid-70s, Crowley decided that the converted furniture vans needed improving. Specialized trailers to haul vehicles were not on the market, so Crowley hired an engineer to design and build its own, becoming the first carrier to offer custom-built enclosed carriers. By the early-80s, Crowley had 18 trucks on the road, many of which were equipped to haul six vehicles at once. Expanding its capabilities yet again, Crowley introduced the most sophisticated liftgate trailers in the industry in 1994, enabling the company to handle the highest load capacity available as an enclosed car transporter. In 2009, Crowley is bigger and better than ever, with a fleet of fully enclosed trailers for classic vehicle shipment. Pickup times are faster than ever before and customer satisfaction continues to, and always will be, top priority. Our truckers custom-built, hard-sided, fully enclosed trailers feature equipment that you just won’t find using other methods of shipping. If you need a classic vehicle hauler to get your vehicle to your vacation destination or that next antique auto show, Crowley selects the service for you. Our truckers can haul your classic cars, muscle cars, and more. Crowley selects trucks that feature power liftgates. Vehicles are lifted safely to each level of the trailer. And if the loading surface isn’t even, the liftgate can tilt to ensure a smooth, level loading. Our truckers also have oversized ramp gates available to safely load longer vehicles, such as limousines and antique fire engines. Air ride cushions your vehicle throughout transit. Thanks to the on-board satellite tracking systems in every vehicle, we know where your prized vehicle is every step of the way. Plastic suspended over all vehicles for added protection. Floor mats and seat covers provide additional protection. We know that you have choices in transporting your vehicle. If you want complete peace of mind, then our enclosed service is the way to go. All of Crowley's transport carriers are custom-built, hard-sided and fully enclosed. We know every vehicle is different, so our carriers are engineered with versatility in mind, able to safely move any vehicle – from a carriage to a racecar – with minimal handling. With our hard-sided, enclosed service, your vehicle is completely protected from every hazard on the road, from dirt and dust to rocks and weather. If you are moving a collector or classic automobile, you won't find a safer method to ship your vehicle than our enclosed vehicle shipping service. We even provide temperature-controlled shipping for vehicles needing additional care. Your vehicle remaining horizontal is essential for safe loading. That's why Crowley trucks are equipped with hydraulic liftgates. It's like an elevator for your ride, so your vehicle remains completely horizontal throughout the loading and unloading process. What forms of payment does Crowley accept? You may pay by submitting your MasterCard, Visa Card or American Express Card number before pickup or you may pay at delivery with a cashier's check, money order or cash. Credit cards are charged only after pickup. To get a quote, submit your information online. To schedule your shipment or use the order form. We are available 24/7 to take your order! Generally, we require a seven-day window for pickups, depending on location. For an additional fee, Crowley offers date-specific pickup and delivery. Dispatch times vary depending on origin and destination locations. For an accurate transit time quote, use the simple order form. It is important to remember, drivers are limited by law to a specific number of miles and hours per day. Other variables that may affect transit times include deliveries along the way, severe weather and road conditions. This practice is discouraged. Additional items may shift during transit, damaging the vehicle's interior. Crowley is not liable for any damage caused to/by loose items during transit. Additional contents may also block the driver's view when loading your vehicle or add additional weight to the vehicle. For more information on packing your vehicle, visit our tips section. Does Crowley Transport ship inoperable or unusual vehicles, motorcycles and extra parts? Yes. We regularly ship motorcycles and inoperable vehicles and specialize in moving unusual vehicles, including antique, specialty and classic automobiles. Inoperable vehicles must roll and steer and can be shipped for an additional $100 fee. Extra parts are accepted on a case-by-case basis, and an additional fee may apply. Please refer to our Relocation Tips when preparing your car for shipment. How can I track my shipment or get a shipment update? To track your vehicle or get an update on your vehicle's status, contact us. Only ¼ tank of gas is necessary for transit. If you’re moving a vehicle from a warm climate to a cold climate, be sure it has a sufficient amount of antifreeze. This will protect it from the cold weather. Looking for an exotic car carrier, classic car hauler or vehicle relocation company? Crowley can help you. Learn more about the services we offer. All companies are Brokers. According to the Department of Transportation, 98% of truck drivers that physically move your vehicle own and operate 2 or fewer trucks. Truck drivers don't advertise online, therefore they rely on brokers to fill their trucks with vehicles. All brokers and truck drivers coordinate through the same Central Dispatch board. That being said, our job is to post your vehicle at the most cost effective price to get it picked-up, in the desired time frame you need! When you get a quote from different companies/brokers it may seem they are all competing for your business. But the reality is you are bidding for the trucking companies to move your vehicle. On a Popular route (Say FL to CA) there's usually 25-30 cars waiting to be picked up on the national dispatch list (used by all truckers). They are all priced from high to low. The trucking companies are naturally motivated by money. So if you picked the lowest quote and there's 24-29 cars all quoted higher on the list, Guess who's not getting picked up. You'll be the last to move, or you simply may never get picked up while a dishonest broker promises you the world and takes your money. There is an old adage that says "if you pay peanuts you get monkeys." Do yourself a favor and spend a little extra money upfront on a company that will value your business and take good care of you and your vehicle. Trying to go the cheap route can cost you weeks, even months and waste more than just your money. Dispatch times vary depending on origin and destination locations. For an accurate transit time quote, call your chosen company. It is important to remember, drivers are limited by law to a specific number of miles and hours per day. Other variables that may affect transit times include deliveries along the way, severe weather and road conditions. Crowley has been helping customers move there cars for over 25 years. With an honest and upfront approach, Crowley is a 5 star company. Crowley treats every customers car as it's own in terms of care. They're experts at getting your vehicle moved as quick as possible.